These larger pre-cut hook and loop (Velcro) sanding sheets are specifically designed for our Q119 sanding pads along with the Bosch/Makita/Porter Cable & DeWalt factory size pads. These quick attach sandpaper sheets have a hook-and-loop backing for easy positioning and removal from matching oscillating sanding pads. 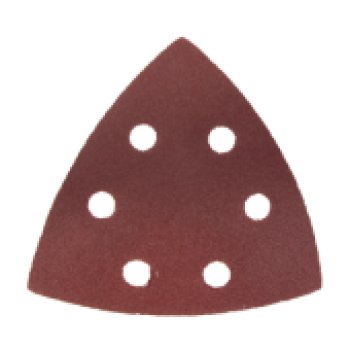 These Triangular sheets measure 93mm tip-to-tip in length and fit hook & loop sanding pads sized 90mm or 3-9/16 inch, tip-to-tip. These larger sanding sheets include vacuum holes to accommodate sanding pads with dust extraction capabilities. Matching sanding pads are also available for purchase, see our Sanding Pad SKU# Q119 for more details. Bosch, Makita, Porter Cable & DeWalt owner's please note: This item is a comparable size match to your factory original sanding sheets. The tip to tip dimension of each sheet is 3-5/8 inches. Our Larger Pre-Cut 120 Grit Sandpaper measure 93mm tip-to-tip and have a Velcro backing and will match fit a factory Bosch/Makita/Porter Cable & DeWalt hook & loop sanding pad. Sandpaper meets or exceeds industry application standards.